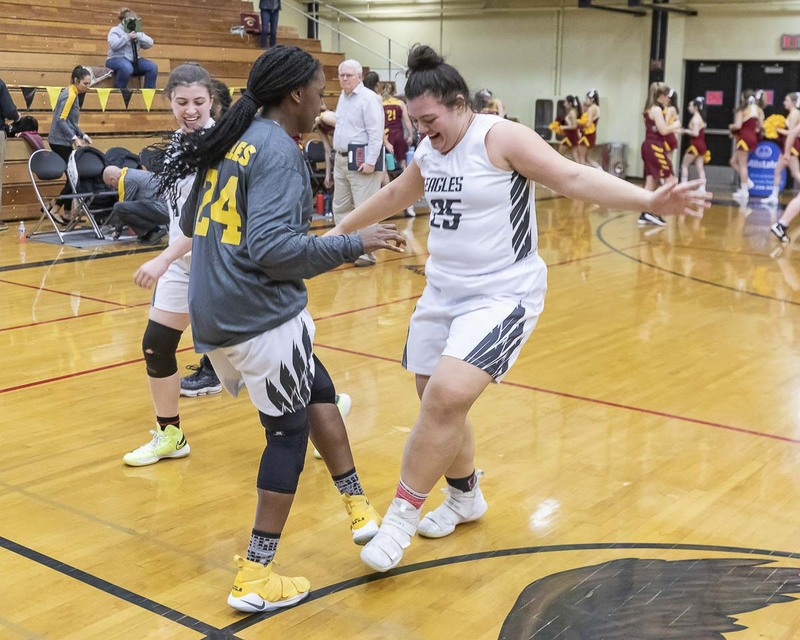 VANCOUVER — The Hudson’s Bay Eagles celebrated a lot more than a win Thursday night in the Class 3A bi-district girls basketball tournament. They also celebrated their fans, their home court, and, of course, each other. 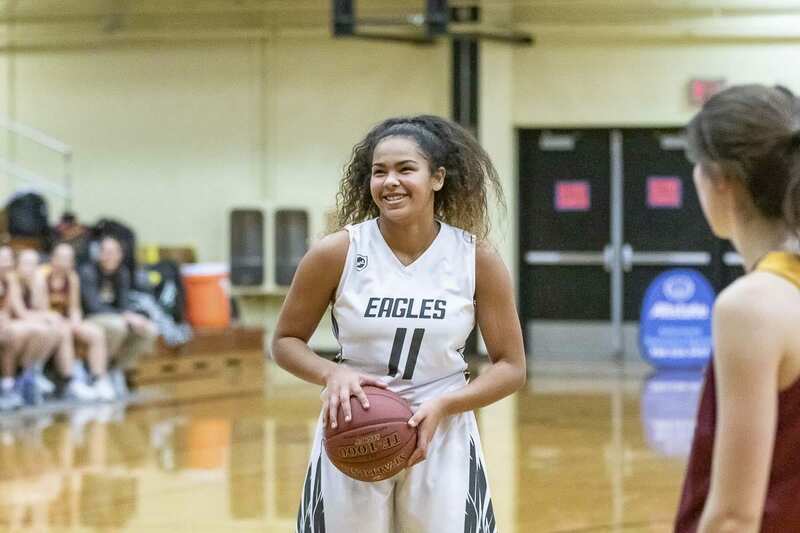 Still, the Eagles took care of business Thursday with a 58-44 win over Capital and also took time to appreciate where they have been, where they are going, and all those who support their mission. “It’s amazing, honestly,” Kamelai Powell said after scoring 19 points and grabbing 15 rebounds in Thursday’s win. Now a sophomore, she remembered showing up to Bay as a freshman, joining a team that won only two games the previous year. The Eagles went 13-10 last season. Hudson’s Bay has made it to the state tournament twice in its history, the last coming in 2007. That year, the Eagles won a league title but back then there was a district tournament prior to the bi-district tourney. The Eagles did not win the district tournament and only played road games in bi-district. No one could recall the exact year when Bay had a home game in bi-district. “It surged the energy for the entire game,” Powell added. “We didn’t really know what to do around here,” Hudson’s Bay coach Michael Rainville joked. 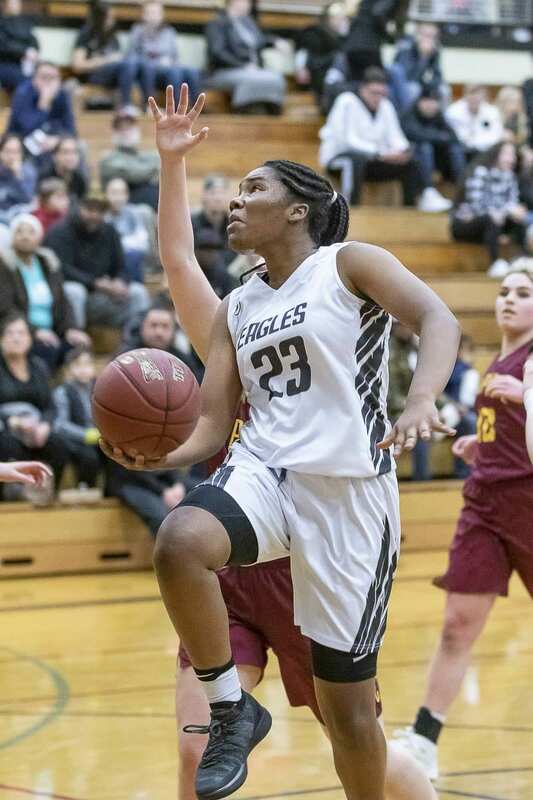 The Eagles never trailed in their win over Capital. Gabriella Garcia, a senior, set the tone with her defense early in the game. It was close for a half, but Bay used a 12-0 run in the third quarter to take a 15-point lead. Hampton added 18 points, and Jaydia Martin scored 12 points. Now it is the waiting game for the Eagles. When the tournament resumes, Bay will play Gig Harbor in the quarterfinals. The game will be at a neutral site but north of Clark County. No more home games are expected. That’s OK, though. 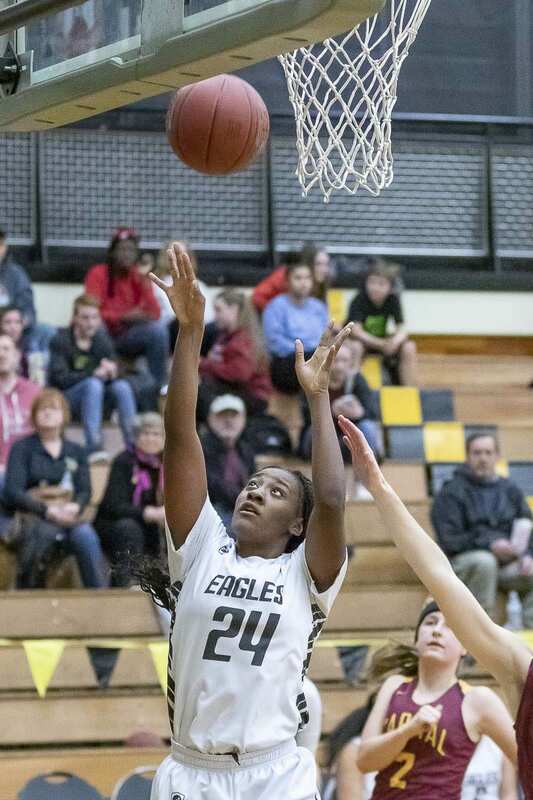 The Eagles, by finishing second in the 3A Greater St. Helens League, earned Thursday’s home game. Then they took advantage to get a win in front of their fans. They pulled to within a game of reaching state. Powell and Hampton noted the team’s chemistry as key to the success this season. “It’s kind of unbelievable,” Hampton said. “We’re family on the court and off the court, whether it’s eating, chilling, or just watching film together. With three sophomores and a freshman in the starting lineup, you might want to get used to that, too. 4A boys: The Union Titans improved to 21-0 with a 75-52 win over Sumner. … Skyview went on the road and crushed Auburn 60-36. Battle Ground was close for three quarters but fell to Curtis 63-56. For now, the tournament is on hold, waiting for the weather. It remains to be seen if there will be a consolation bracket for teams such as Battle Ground. Union and Skyview are in the quarterfinals, though. 4A girls: The co-champions of the 4A Greater St. Helens League both won their games Thursday night, advancing to the quarterfinals. Camas had no trouble at home with Sumner, winning 61-19. Union picked up a big road win, taking down Kentwood 52-43. … Skyview, meanwhile, lost at Bellarmine. 2A: The Class 2A District 4 boys and girls tournaments will have first-round games tonight, and no games are scheduled for Saturday. League champions Columbia River (boys) and Washougal (girls) play home games at 6 p.m. tonight. … However, the Woodland girls home game against Black Hills has been called off for tonight due to snow already hitting the Olympia area. Black Hills was told it could not travel on Friday. 1A boys: Trico League champion La Center cruised Thursday in the opening round of the 1A District 4 tournament, topping Tenino 90-48. King’s Way Christian also prevailed, beating Hoquiam 70-36. Meanwhile, Seton Catholic lost its opener to Montesano 70-68. As of Friday morning, the brackets still had games listed for Saturday. Fans should be flexible, though, due to weather. 1A girls: King’s Way Christian, the Trico League champion, has a home game tonight against Forks. La Center plays at Montesano.